THIS ITEM IS NOT AVAILABLE AT PRESENT. 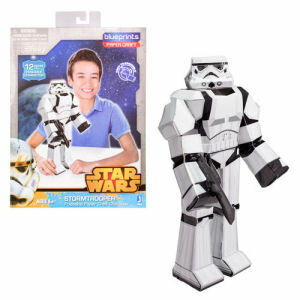 WE WILL NOT BE GETTING ANYMORE Star Wars Stormtrooper 12-Inch Blueprints Papercraft. From the Star Wars collection by Jazwares. Star Wars Stormtrooper 12-Inch Blueprints Papercraft. No scissors - No tape - No glue. Assembles in about 5 minutes. Measures 12 inches tall. Jazwares Star Wars Models shipping from Canada. No Surprise Border fees or Customs!